Aim and Objectives: To compare effectiveness of surgical blade, electrosurgery, free gingival graft (FGG), and diode laser for the management of gingival hyperpigmentation. 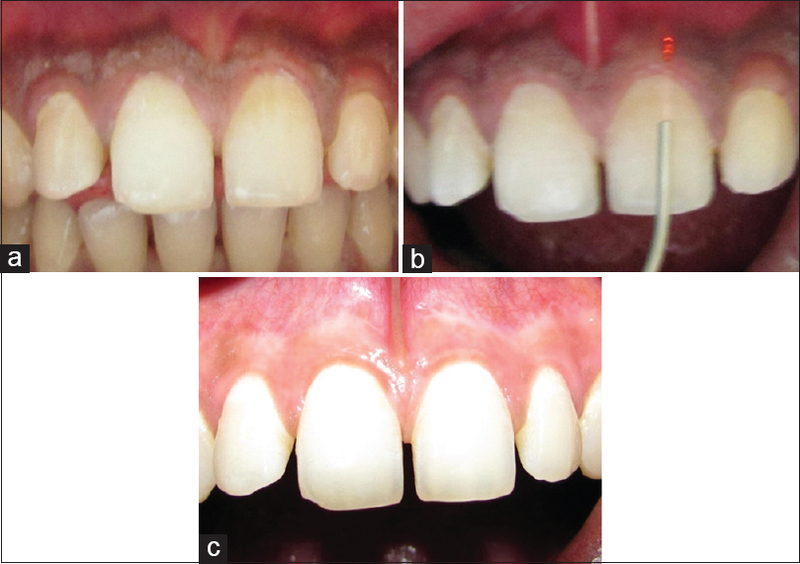 Materials and Methods: Forty patients who were concern for the unesthetic anterior gingival due to melanin hyperpigmentation were treated in this study. Of 40 patients, 10 patients were treated using surgical blade, 10 by electrosurgery, 10 using FGG, and 10 patients using diode laser. The gingival hyperpigmentation was recorded preoperatively and 3 months postsurgery by measuring area of hyperpigmentation in square millimeters and severity of hyperpigmentation using Dummet's oral pigmentation index. Results: Healing was uneventful and required no supportive therapy. No patients experienced severe pain during or postsurgically. Mild discomfort was more common in FGG during the 1st week. At 3 months localized area of repigmentation was seen in group treated by surgical blade and electrosurgery. However, no repigmentation was noticed at 3 months in diode laser group and free gingival group. Conclusion: Depigmentation of gingival hyperpigmentation using diode laser and FGG were found to be effective procedures. However, diode laser yields esthetically acceptable results along with patient satisfaction. Smile expresses a feeling of joy, success, affection, and courtesy and also reflects self-confidence. The harmony of a smile is not only determined by the shape, position, and color of the teeth, but also by the gingival tissues. Gingival health and appearance are essential components of an attractive smile. The color of healthy gingiva is variable, ranging from pale pink to deep bluish purple. Between these limits of normalcy, a large number of color variations are observed, which depends primarily on the vascular supply, the thickness of epithelium, degree of keratinization, and the presence of pigments within the epithelium. Melanin, carotene, reduced hemoglobulin, and oxyhemoglobulin are main pigments contributing to normal color of oral mucosa. Gingival health and appearance are essential components of an attractive smile. Frequently gingival hyperpigmentation is caused because of excessive melanin deposition by melanocytes which reside in basal and suprabasal layer of epithelium and is transferred to basal cells where it is stored in the form of melanosomes. Although melanin pigmentation of the gingiva is completely benign and does not present a medical problem, complaints of black gums are common particularly in patients with high smile line thus cause esthetic problems and embracement particularly if pigmentations are visible during speech and smiling. Systemic conditions such as endocrine disturbances, Albright's syndrome, Malignant melanoma, PeutzJeghar's syndrome, trauma, chronic pulmonary disease, and racial pigmentation are known cause of oral melanin pigmentation. In general, individuals with fair skin will not demonstrate overt tissue pigmentation although comparable number of melanocytes are present within the gingival epithelium. Pigmented granules are present only when melanin granules synthesized by melanocytes are transferred to keratinocytes also known as epithelium-melanin unit. The melanocytes are dendritic cells unattached to surrounding epithelium cells behave as unicellular exocrine glands. Active melanocytes convert tyrosine to melanoprotein which is transferred to basal and prickle cell layers. Gingival hyperpigmentation is seen as a genetic trait in some populations and is appropriately termed as physiological or racial pigmentation (Dummett 1980). Clinicians have tried to remove melanin hyperpigmentation of gingiva by various methods. Chemical agents such as 90% phenol and 95% alcohol have been used in combination (Hirschfeld, et al), however, these chemical agents are quite harmful to oral soft tissues. Free gingival graft (FGG) surgery has also been tried to eliminate the hyperpigmented area  but this requires an additional surgical site and color matching. Abrasion techniques using large, round diamond bur in a high-speed handpiece with copious irrigation has also been used, but it is difficult to control the depth of de-epithelization and obtain adequate access. Gingivectomy has also been used; however, this is associated with prolonged healing by secondary intention and excessive pain. 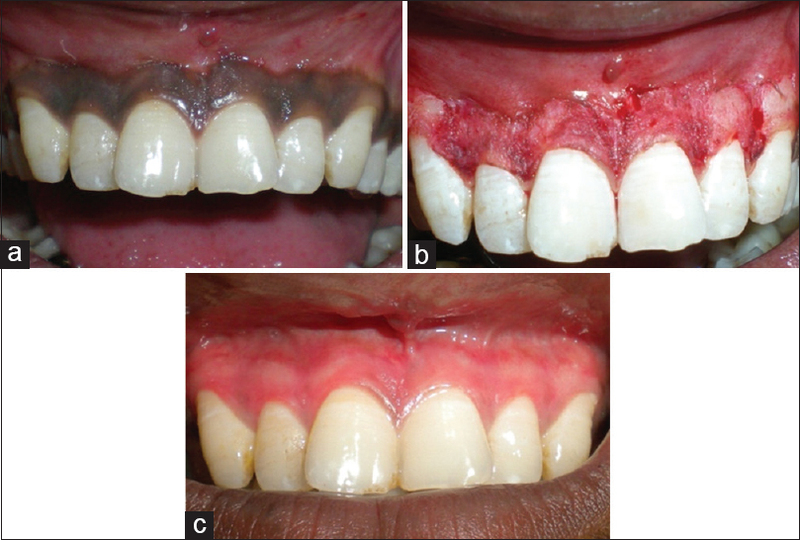 Gingivectomy results in nonpermanent depigmentation when performed solely for cosmetic reasons. Cryosurgery depigmentation is another option (Tal et al. 2003). This technique requires a skillful clinician to manage the complicated technique and instruments. The CO2 laser also achieved good results in eliminating the melanin hyperpigmented gingiva  and repigmentation has not been reported. The present study was undertaken to compare four different depigmentation techniques (surgical blade, electrosurgery, FGG, and diode laser) and their effectiveness to achieve esthetically acceptable results [Table 1] and [Table 2]. Forty patients who were a concern for the unesthetic anterior gingival due to melanin hyperpigmentation were treated in this study. Out of 40 patients, 10 patients were treated by using a surgical blade, 10 by electrosurgery, 10 using FGG, and 10 patients by using diode laser. The gingival hyperpigmentation was recorded preoperatively and 3 months postsurgery by measuring the area of hyperpigmentation in square millimeters and severity of hyperpigmentation using Dummet's oral pigmentation index. Moreover, pain score was measured by VAS. Pregnant women or lactating women. n = Area in number of squares postoperatively. The estimation was based on the following scale. 3 - Deep brown/blue-black tissue (heavy clinical pigmentation). The VAS was used to evaluate the subjective pain level experienced by the patient. It consists of horizontal line 100 mm long starting at the left end with descriptor “no pain” and ending at the right end with “unbearable pain.” Patients were asked to mark severity of pain. The distance of this point in millimeters, from left end of scale was 0 – no pain, scores between 0.1 and 3.0 were recorded as slight pain, 3.1–6 was considered as moderate pain, and scores 6.1–10 were recorded as severe pain. Immediately, before the surgical treatment, the patients were made to rinse the mouth with 0.2% chlorhexidine gluconate solution for 1 min. The areas subjected to surgery were anesthetized by infiltration anesthesia, using local anesthetic solution 2% xylocaine with 1:10,000 epinephrine. Depigmentation using laser: Topical anesthetic gel is applied to the operation field. In compliance with the Food and Drug Administration (FDA) rules, patient and staff should wear special eyeglasses for protection. Caution should be taken since the laser beam may be reflected from dental mirror or instruments and absorbed by other intra-oral regions. Laser application started with a sweeping motion localized only on the pigmented area. The procedure is performed in cervicoapical direction on all pigmented area. Every 2–3 min operative field is wiped with sterile gauze soaked 1% normal saline solution. The depigmentation procedure continued until no pigmentation remained. No periodontal pack or additional material is applied to support the healing procedure [Figure 1], [Figure 2], [Figure 3], [Figure 4]. Recall after 24 h, 1 week, 6 weeks, and 3 months postoperatively. Every patient is recalled after 24 h of surgery, 1 week, 6 weeks, and 3 months postoperatively. No postoperative infection or scarring, gingival recession or deformity occurred in any of the patients on first or subsequent visits. Healing was uneventful in patients from all + four group. Compared to surgical blade and electrosurgery healing after treatment with diode laser was slightly delayed and it was significantly delayed with cases treated by FGG. At the VAS evaluation sites operated by surgical blade no evaluation of pain and discomfort was made at the time of surgery because the patient was under anesthesia. At VAS evaluation sites moderate pain was recorded on the second day of surgery for surgical blade and electrosurgery cases. However, the pain was reduced considerably 1 week after the surgery. The VAS score for the FGG was severe on the second postoperative day which was reduced to mild 1 week after surgery. However, patients treated with diode laser, only slight or no pain was recorded. The melanin pigmentation index showed no recurrence of pigmentation in patients treated with diode laser and FGG, but some degree of repigmentation was seen in the group of patients treated with electrosurgery and surgical blade. All patients were satisfied with the esthetically significant improvement in gingival color. Pigmented gingival tissue often forces patients to seek cosmetic treatment. Several treatment modalities have been suggested in literature. Among these, use of surgical blade is commonly employed procedure. The use of the scalpel technique for depigmentation is the most economical one as compared to other techniques which require more advanced armamentarium. It is simple, easy to perform and above all with minimum discomfort. However, scalpel surgery causes unpleasant bleeding during and after the operation, and it is necessary to cover the surgical site with periodontal dressing for 7–10 days. Electrosurgical technique was much easier to perform than the slicing technique with good patient acceptance with least amount of bleeding. However, the long-term results of the electrosurgical technique may not be as predictable as with other techniques. In addition, depth control is difficult. Prolonged or repeated application of current to the tissue induces heat accumulation and undesired tissue destruction. A FGG used to eliminate the pigmented areas requires an additional surgical site (donor site) and color matching and additional discomfort. Furthermore, the presence of a demarcated line is commonly observed around the graft in recipient site may itself pose an esthetic problem. The application of diode laser appears to be a safe and effective alternative procedure for the treatment of gingival melanin pigmentation., Its benefits include ease of usage, effectiveness in the treatment of superficial benign pigmented lesions, convenience in dental clinics, and decreased trauma for the patient. It has been demonstrated that Er: YAG laser is also a good and safe choice for removal of pigmented gingiva without local anesthesia and the postoperative period is comfortable for the patients and healing is comparatively fast and good. Thorough removal of pigments, pain reduction, and higher patient preference were important features associated with Er: YAG laser depigmentation. At the VAS evaluation sites operated by surgical blade no evaluation of pain and discomfort was made at the time of surgery because the patient was under anesthesia. At VAS evaluation sites moderate pain was recorded on the 2nd day of surgery for surgical blade and electrosurgery cases. However, pain was reduced considerably 1 week after the surgery. The VAS score for the FGG was severe on second postoperative day which was reduced to mild 1 week after surgery. However, patients treated with diode laser showed only slight or no pain. The area of repigmentation seen was 18.57% for surgical blade, 19.66% for electrosurgery cases, 0% for FGG  and 1.6% for patients treated with Lasers which also simulate the results obtained from Perlmutter and Tal 1986 in which they compared surgical blade, diamond bur, and diode laser therapy. Color of the gingival plays a major role in the overall maintenance of esthetics. Hyperpigmentation of the gingiva can severely compromise the esthetic appearance of an individual. The growing esthetic concern requires the removal of unsightly pigmented gingival areas to create a pleasant and confident smile, which altogether may alter the personality of an individual. Various techniques have been employed for the same. There was slight amount of repigmentation seen after treatment with surgical blade and electrosurgery and minimum amount of repigmentation seen after treatment with use of laser and FGG. However, the VAS scores were highest for the FGG, and no pain and discomfort was associated with the use of Laser. Therefore, patient acceptance and preference for the use of laser therapy for depigmentation were more. 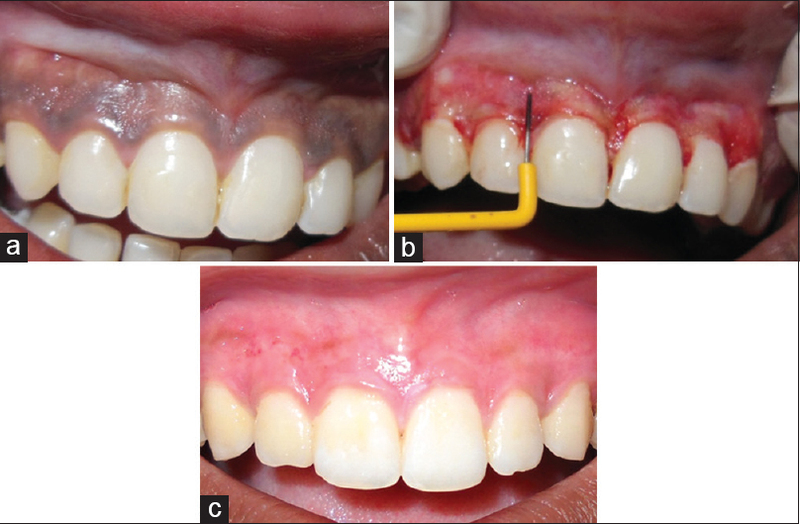 Gupta KK, Srivastava A, Chandra C, Tripathi V. Lip repositioning with crown lengthening and gingival depigmentation: A case report. J Periodontol Implant Dent 2011;3:38-42. Dummett CO, Sakumura JS, Barens G. The relationship of facial skin complexion to oral mucosa pigmentation and tooth color. J Prosthet Dent 1980;43:392-6. Rosa DS, Aranha AC, Eduardo Cde P, Aoki A. Esthetic treatment of gingival melanin hyperpigmentation with Er:YAG laser: Short-term clinical observations and patient follow-up. J Periodontol 2007;78:2018-25. Dummett CO. Oral tissue color changes (I). Quintessence Int Dent Dig 1979;10:39-45. Hirschfeld I, Hirschfeld L. Oral pigmentation and a method of removing it. Oral Surg Oral Med Oral Pathol 1951;4:1012-6. Tal H, Oegiesser D, Tal M. Gingival depigmentation by erbium:YAG laser: Clinical observations and patient responses. J Periodontol 2003;74:1660-7. Vongsurasit T. Technic of preventing gingival recession from using rubber dam for GTR. J Dent Assoc Thailand 1996;46:203-10. Lange DE, Bernimoulin JP. Exfoliative cytological studies in evaluation of free gingival graft healing. J Clin Periodontol 1974;1:89-96. Lagdive S, Doshi Y, Marawar PP. Management of gingival hyperpigmentation using surgical blade and diode laser therapy: A comparative study. J Oral Laser Appl 2009;9:41-7. Azzeh MM. Treatment of gingival hyperpigmentation by erbium-doped:Yttrium, aluminum, and garnet laser for esthetic purposes. J Periodontol 2007;78:177-84. Krause LS, Cobb CM, Rapley JW, Killoy WJ, Spencer P. Laser irradiation of bone. I. Anin vitro study concerning the effects of the CO2 laser on oral mucosa and subjacent bone. J Periodontol 1997;68:872-80. Berk G, Atici K, Berk N. Treatment of gingival pigmentation with Er, Cr:YSGG laser. J Oral Laser Appl 2005;5:249-53. Perlmutter S, Tal H. Repigmentation of the gingiva following surgical injury. J Periodontol 1986;57:48-50.